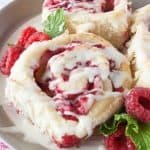 These beautiful raspberry cheesecake sweet rolls are irresistibly delicious! Great for breakfast, brunch or a midnight snack! While the dough is rising for a second time, spray a 9×13 baking dish with non-stick cooking spray and mix up the cream cheese filling. Place the frozen raspberries in a gallon size ziploc type bag and add the cornstarch to them. Seal the bag and shake the raspberries until they are well coated. Sprinkle over the top of the cream cheese filling. Roll up the dough jelly roll style and slice into 1 1/2 inch slices. Refer to my post for instructions on how to slice these with dental floss. Place the slices into the prepared baking dish. I can only fit 12 in my 9×13 pan so if you got more than 12 you will need an additional smaller pan. Cover and let rise in a warm place for 30 minutes. Preheat the oven to 350 degrees and make the icing. These will probably not double in size. The frozen raspberries will make them rise slower. After 30 minutes they will have risen some, but probably not doubled. Bake at 350 degrees for 25-35 minutes. The tops should be lightly browned and the center roll should be done. Cool about 15 minutes before drizzling with icing. Beat the cream cheese, butter, sugar and vanilla together until smooth.